Nicole Brammer helps Randall Powers with his personal protective gear (PPE). Both Brammer and Powers work in Emory University Hospital's Serious Communicable Disease Unit. Emory Healthcare and Emory University School of Medicine are partnering with the Centers for Disease Control and Prevention (CDC) to provide training, educational resources and consultation for the 48 identified U.S. medical centers that have been designated Ebola treatment centers. These centers have developed or are developing specialized hospital units capable of treating and managing patients diagnosed with Ebola virus disease. Emory has received a training contract through the CDC that includes different methods for sharing best practices when caring for patients infected with the Ebola virus. The methods include: training conferences, educational resources and site visits to centers that have been designated U.S. Ebola treatment facilities in their state or region. Both Emory and the University of Nebraska Medical Center and their clinical partner, Nebraska Medicine, are partnering with the CDC to assist in Ebola preparedness training. Emory has hosted three Ebola preparedness training conferences thus far, focused on the management of hospital units created to care for patients diagnosed with Ebola virus disease. 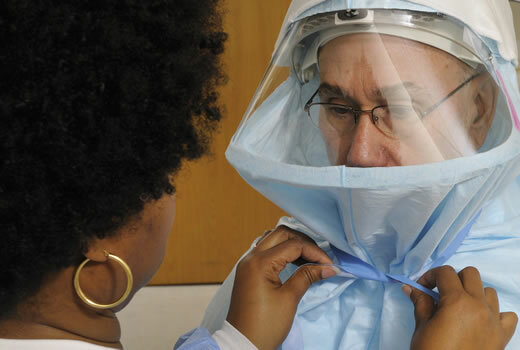 At these conferences, Emory experts discuss clinical care and patient management, staff and infrastructure development, donning and doffing personal protective equipment (PPE), laboratory protocols, consideration for pediatric and OBGYN patient populations, waste management and occupational health management of clinical staff. "These conferences give us the opportunity to share our knowledge about what worked and what needed to be adapted to better fit the care model while our staff cared for four patients with confirmed Ebola virus disease," says Bruce Ribner, MD, MPH, medical director of Emory's Serious Communicable Diseases Unit and professor of medicine in the Division of Infectious Diseases at Emory. "It is our mission to pass on what we have learned to other health care providers and hospital staff, so they can ready themselves and their medical centers to also care for patients diagnosed with Ebola." The training contract also involves as-needed conference calls, sometimes weekly, dedicated to different Ebola care management topics, with calls moderated by the CDC. Subject matter experts from Emory and Nebraska rotate in taking part in these call-ins, where topics can range from nursing to laboratory to operations, plus more. Finally, Emory physicians and nurses have been going on various site visits to other U.S. hospitals that have set up or are in the process of setting up Ebola treatment units. Emory Ebola team members provide consultation and feedback to these centers as they prepare their hospital and staff to care for these patients. "This training contract provides the opportunity for enhanced learning from skilled experts within Emory University and Emory Healthcare," says Sharon Vanairsdale, MS, APRN, clinical nurse specialist for Emory's Serious Communicable Diseases Unit. "We are excited to be a part of this contract, in an effort to assist other health care providers and staff." To also share protocols and procedures for caring for patients with Ebola virus disease, Emory Healthcare launched an Ebola preparedness website in Oct. 2014, detailing daily operations in Emory's Serious Communicable Diseases Unit.